Toccata artist Robert Crowe has penned a guest-blog for the site, The Opera Stage. 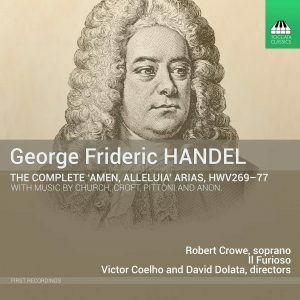 Read the excerpt below, and continue reading on TheOperaStage.com and hear his extraordinarily dramatic timbres on our new release of George Frideric Handel’s Complete ‘Amen, Alleluia’ Arias recording. One of the apparently unchanging things about being a singer with an Unusual Voice is that you are often asked to explain not only what it is you do, but, obliquely, what it is you are, by people who have just heard an hour or two of it. While your inner artist recoils at a question that seems to ignore the soul-to-soul communication that you thought you had just accomplished, people are, for the most part, genuinely and innocently curious about someone who appears to exist outside of societal norms. Frequently, to have a rare voice-type is to be under a microscope. Either you are coerced into a position of constant self-justification, or you are cajoled and seduced into never-ending singerly contemplations of self. “My Art, My Music, My Struggle, My VOICE, etc.” You can see where this might end badly. When I started singing at the age of eighteen, I was an adequate second tenor. No one paid me any particular attention, but I was able to land my first church gig largely thanks to my sight-reading ability. The world continued to pay me very little attention until the age of twenty-one, when my chagrined ego realized that I wasn’t going to be able to have a solo career as an adequate second tenor. I bowed to the inevitable and switched to my somewhat dreaded “other voice,” my countertenor. It was really a male soprano, though at that time neither the term nor the concept was in widespread usage in the U.S. Countertenors in the early nineties were public oddities who attracted all kinds of attention, positive and not so positive. Guest blog posts from Toccata Classics and Toccata Press artists, composers, and authors.